With the results of their musical ‘Experiment’ returning positive – as marked by the mass adoption of folk in to mainstream worship – Rend Collective (F.K.A. Rend Collective Experiment) have wisely decided to drop the third word from their name like many of their fans have already been doing so for many years. Along with this name change, the Northern Irish foot-stompers bring their latest musical offering to the table, titled ‘The Art Of Celebration’. Inspired by a theological breakthrough this album is the bands response to learning and rediscovering that joy (and not seriousness) is a fruit of the spirit (Gal 5:22-23). Although their music has rarely been described as solemn and serious, this revelation is a great place to start any worship album at and as such it’s no surprise that the opener of this record is a track titled ‘Joy’. Starting with the familiar sound of acoustic guitars and ukelele’s that bounce off the joyful lyrics, it doesn’t take long for Rend Collective to get going, quickly jumping into a mighty, upbeat chorus that sets the tone of the record. Though the music may be somewhat closer to pop than their usual folk style it’s the lyrics of the track that stand out. This isn’t just a happy sing-song that ignores grief, but is actually a complete recognition of the extremes of our emotions. Yes, Christ is our joy, and we are called to “Rejoice in the Lord always.” (Phi 4:4) but that doesn’t mean life is without pain, suffering and brokenness. Harking back to the album title, celebration is an ‘art’ to be practised, it doesn’t come by ignoring pain and just wearing a smile instead but actually comes through holding on to steadfast truth. Though lyrically good throughout, I can’t help but feel that some tracks feel musically forced at times. 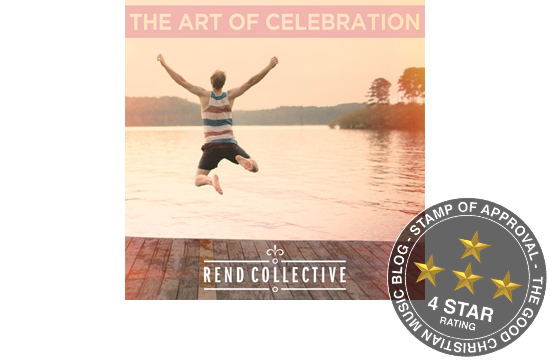 The indie folk side of the band sounds great on this record but the pop influences sound less natural – the manufactured pop style may go down well with the Christian radio stations and youth conferences but Rend Collective are at their best when they sound like Rend Collective! An example of this manufactured style is the track Burn Like A Star, the lyrics are good, but musically it just doesn’t feel as natural and organic as tracks like All That I Am, Finally Free, Create In Me and Boldly I Approach (The Art Of Celebration) to name just a few. One of the louder and triumphant songs of the album is the hugely popular worship anthem My Lighthouse. This track beautifully references the pillar of smoke and fire that leads the Israelites out of Egypt in the exodus and tries to create a similar image with the more modern imagery of a lighthouse. Very singable, and very true about Jesus, the only problem being that lighthouses don’t safely guide ships to shore and in no circumstances should be followed but actually warn ships of imminent danger (Rend Collective: great musicians, but not so great sailors)! Technicalities and sarcasm aside though, it’s a great, exuberant worship song bound to find it’s way into many churches sunday setlists. With the first four tracks of the album following a similar style to My Lighthouse, the record slows things down with the track All That I Am. At first glance it may seem like the band has lost their joyful bounce and turned to the exact thing they wanted to avoid – seriousness – however the track serves as a great reminder that joy is not always loud and ecstatic. I’ll repeat that again, joy is not always loud and ecstatic, as it becomes clear upon multiple listens that this song, although quieter and less energetic than the album openers is written out of a deep joy found only in Christ. As a result, listening to this track feels like peering into the band’s personal life and joining in an intimate, genuine, deep joyful worship session. This style of worship isn’t just limited to the chilled, acoustic tracks either as it seems to continue throughout the rest of the album, occasionally accompanied by strings in tracks like Immeasurably More and Strength Of My Heart. The highlights of the record then occur in the songs that find the perfect balance between the quiet joy and the loud rejoicing. This is done brilliantly in the track Finally Free and again (but in a different style) in the title track Boldly I Approach (The Art Of Celebration) setting the stage for a perfect mighty finish to a strong album. However, the listener is then confronted with two seemingly out of place songs, a live version of My Lighthouse and a remix of Joy. The live track is good, but having already been released as a single in three different forms it seems overkill that it appears yet again. Following in the recent footsteps of Hillsong United and Jesus Culture, the apparently anonymous remix of Joy then attempts to shift Rend Collective into the realm of electronica but sadly fails spectacularly by doing no more than adding drums and the occasional synth to the original. This then produces a track that’s neither indie folk pop or electronica but a strange and bland mix of both. Don’t get me wrong though, I’m personally a huge fan of electronic music (it’s no big secret that this blog was inspired by YouTube channels such as Majestic Casual) and it’s not even that Rend Collective shouldn’t be remixed at all. However, remixing is a careful craft that can produce great results but in this situation it seems no more than a gimmick. Lacklustre remix aside, this album is a great release from everyone’s favourite indie folk worship celebration band and sees the Northern Irish Jesus lovers push themselves into a more polished and matured sound that largely remains true to their ‘Organic Family Hymnal’ days that put them on the map. Overall, The Art Of Celebration shines brightly in the vast sea called contemporary worship music and begs for these songs to be used in churches and not just kept to the confines of hipster Christian’s playlists and youth pastor’s iPods.